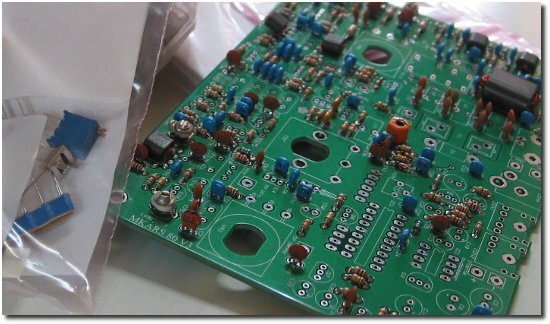 The intro picture shows the MKARS80 transceiver constructed up to nearly completion of Bag 3 of components. 1 SIL 10 way socket. The above list represents 162 solder joints as I did not fit the IRF510 at this stage. Additionally I had still to wind the toridal transformers plus finish off the coils from pack 3. This took me around six hours complete and leaves at the point of moving onto the hardware pack. From memory the build to the point shown in the picture above took around 5 hours to complete so I’m probably up to 11 hours so far. I can’t say building this kit has taught me much about the radio. This is due to the construction plan which is geared towards getting the project build and working. Therefore the construction runs along the lines of take the 15 1N4148 diodes and insert into D1, D2, D3 etc so you’ve really no idea what their function is, other than a switching diode, which you know because you know. You don’t learn, by way of a made up example, that D12 and D14 form the switch arrangement of the modulator/ demodulator. What you do learn is how to stuff components into the boards and rattle along to completion. The parts bags are packed to support this method with no doubt experience showing this is the best way to help most of the people end up with a finished transceiver. You work with one type of component until you’ve fitted all of that type where upon you move onto the next type of component. This does have the advantage that mixing up the components is minimised which is another real issue of fails to work. In contrast to this I have the Genesys 2030 SDR kit which I’ve yet to start that takes the perspective from building a module at a time and testing that module before moving on to the next module. 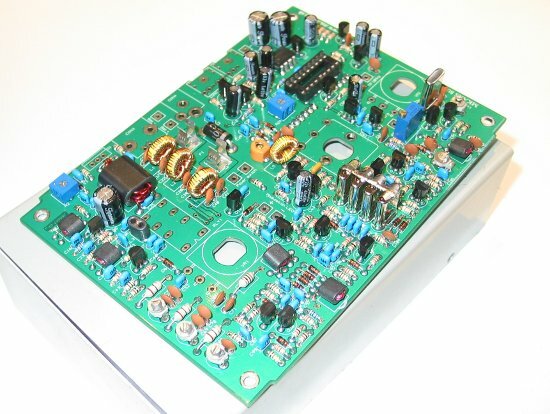 This method results in you understanding all the components that make up the mixer section, power supplies etc as you build the radio and that you know the work you’ve done so far is actually functional. I am tempted to buy another MKARS80 kit and rework the build instructions to this second method since I feel it teaches you the most. However there may be a good reason why this approach isn’t taken on the MKARS80 as it does use bi directional modules used for transmit and receive, but surely that should make it more testable than less so?? Having incorrectly fitted R57 I need to address before final testing. I got confused over the value of the component and R57 and thus fitted a 57R resistor into the R57 component placement. This taught me the difficulty of de-soldering on a plate through board. I shall need to resort to drilling out the remaining solder with a pin vice by hand. So all I am left with is a board that looks like this picture below and have no idea that all the work that’s been put in so far is working. I won’t know that until I get to having completed bag 4 where we do basic voltage checks before moving onto to completing the construction where upon we switch the unit on and find out if the whole thing either works or doesn’t. Tagged Amateur Radio, Homebrew, MKARS80 SSB Transceiver, Radio kits. Bookmark the permalink.